Back in the 1960s it was not uncommon for railroads to run mixed trains of rather impressive proportions -- in length and distance. Here's Southern Pacific's #21, in either Wells or Winnemucca, Nevada, in 1965. Tucked away in the middle of the consist is a chair car which started its journey at 8:30am in Ogden, Utah, and ended it at Oakland, California, at 2:25am, 780 miles later. These trains are long gone, killed by interstates, but this area of Central Nevada is still served by the California Zephyr. Zephyrs across the years. 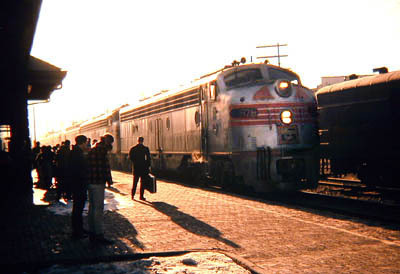 On the left is a shot of the Burlington's Kansas City Zephyr, armed with a Parlor-Dining car, a dome chair car and standard reclining seat chair cars, taking on Chicago bound passengers in Macomb, Illinois, at 5:00pm on a cold March day in 1965. 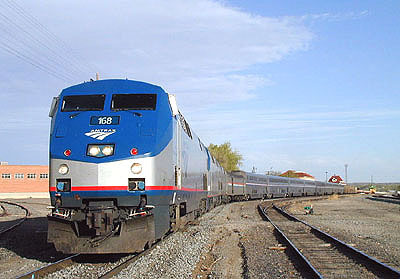 Amtrak continues to provide Chicago-Macomb service via a daily train to and from Quincy, but uses the more northern ex-Santa Fe route for today's Kansas City runs. Though the dome and diner are long gone, there is still cafe and business class service. 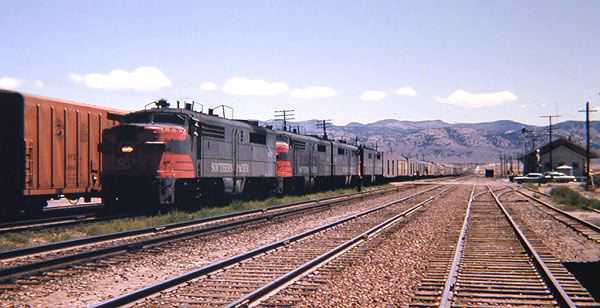 Residents of Grand Junction, Colorado, are luckier, what with service from one of America's best and most enduring trains. 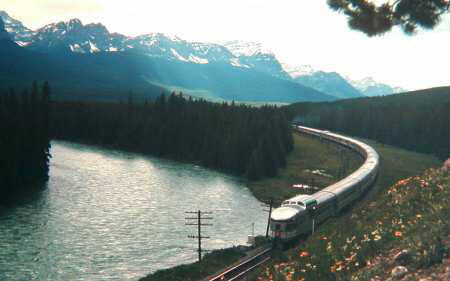 On the right is the California Zephyr in all its glory in April, 2002, parked long enough for trackside vendors to sell souvineers and snacks to a horde of happy passengers who have just passed through some of the most breathtaking scenery in the world, and will soon enjoy a fabulous sunset in red rock country. 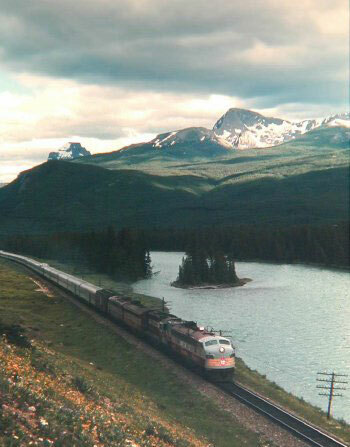 It's 1969 and the Canadian Pacific's transcontinental Canadian is winding its way through Banff National Park in Alberta. The all stainless consist included a scenic-dome lounge sleeper with drawing-room and bedrooms, a scenic dome coffee shop, streamlined sleepers (with roomettes and berths), coaches and dining car. Happily VIA has refurbished and maintained the glory of this train, albeit on less than a daily schedule, and it remains one of the world's great trains. Happily as well, Canada is rethinking passenger rail, adding new equipment and looking at adding to its route structure. Hopefully, some good lessons for Amtrak. 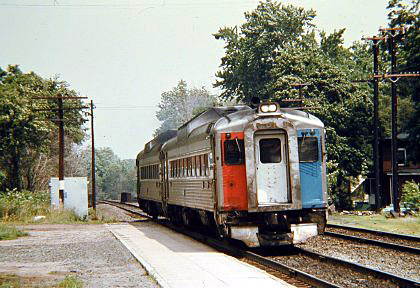 It's 1981 and Amtrak's Springfield Line RDC's are, if my memory serves me correctly, on their last weary legs. 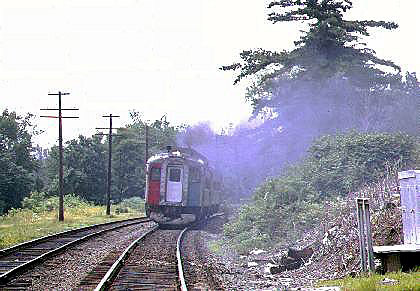 Here are a couple huffing and puffing to and from Windsor on their way to New Haven, where passengers would pick up a Boston - New York train, on a hot summer day. I lived not far away and spent a lot of time riding them. In those days the Big Apple journey could be quite an adventure, what with truly awful timekeeping, particularly on the New Haven - New York part of the trip, and more than just an occasional breakdown somewhere in the Connecticut wilds. I wish many of the current Amtrak bashers had been able to bump along next to me in those bad old days. Some things do improve markedly over time. Changes last made on: August 27, 2003.